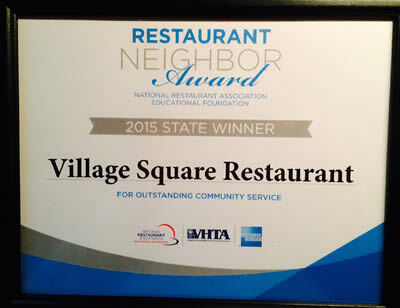 Village Square Restaurant, and its two units, has been a big supporter of the Winchester schools with hundreds of gift certificates ever since the first restaurant opened, more than 13 years ago. Another cause that has sparked a call to action for Village Square is an annual fundraiser for the Valley Health Wellspring Cancer Center. The two restaurants over the last decade have raised more than $150,000 in support of the center through its annual “Celebration of Hope,” gala dinner. The restaurant’s executive chef, Dan Kalber, lost his grandfather to pancreatic cancer and has been a catalyst for Village Square’s support of Valley Health. “We have made it our policy that anyone who donates their time to fundraise for the benefit of the overall community will find a welcome in our restaurant when they come through the door,” says Joerg Eichmann, owner.